Scientists at The Scripps Research Institute (TSRI) now have a high-resolution view of exactly how the experimental therapy ZMapp™ targets Ebola virus. The new study is also the first to show how an antibody in the ZMapp™ “drug cocktail” targets a second Ebola virus protein, called sGP, whose vulnerable spots had previously been unknown. “Determining the proper balance in targeting these two Ebola proteins will be key to building improved therapeutics,” added Ward. Scientists need detailed images of Ebola virus’s molecular structure. Like enemy reconnaissance, structures can show where Ebola is vulnerable and how medical treatments can neutralize it. “We’re at the cutting edge of our ability to resolve high-resolution protein complexes,” said TSRI Research Associate C. Daniel Murin, co-first author of the new study with TSRI Research Associate Jesper Pallesen. In the new study, the researchers used cryo-electron microscopy to see exactly how Ebola virus interacts with the three antibodies in the ZMapp™ experimental therapy produced by Mapp Biopharmaceutical, also a study collaborator. “The three components of ZMapp™, now resolved at high-resolution, can be further engineered in a structure-based manner for improved potency,” said Ward. Next, the researchers took a closer look at one of the three antibodies that make up ZMapp™, called 13C6. This antibody is unique because it can also target the soluble Ebola protein sGP. One obstacle to understanding sGP is that it is too small to be seen with cryo-electron microscopes. To solve this problem, the researchers added “bulk” by pairing sGP with antibodies, including 13C6. This allowed them to kill two birds with one stone—they could see sGP’s structure while also studying how antibodies interact with it. 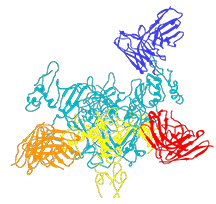 The new image shows the binding sites, or “epitopes,” the antibody targets. “We can see hot spots on this virus that we can hit,” said Pallesen. In addition to Saphire, Ward, Murin and Pallesen, authors of the study, Structures of Ebola virus GP and sGP in complex with therapeutic antibodies, were Natalia de Val, Christopher A. Cottrell, Kathryn M. Hastie, Hannah Turner and Marnie Fusco of TSRI; Kristian G. Andersen of TSRI and the Scripps Translational Science Institute; Andrew I. Flyak and James E. Crowe of Vanderbilt University and Larry Zeitlin of Mapp Biopharmaceutical. This study was supported by the National Institutes of Health (NIH, grant R01 AI067927), the NIH’s National Institute of Allergy and Infectious Diseases (grants U19AI109762 and U19AI109711) and the National Science Foundation. You can help researchers at The Scripps Research Institute find a cure for Ebola by donating your computing power to this project and encouraging others to join.